There are some more, but this here’s a good starting point. Know of any others? Hook me up and I’ll add them to the list! 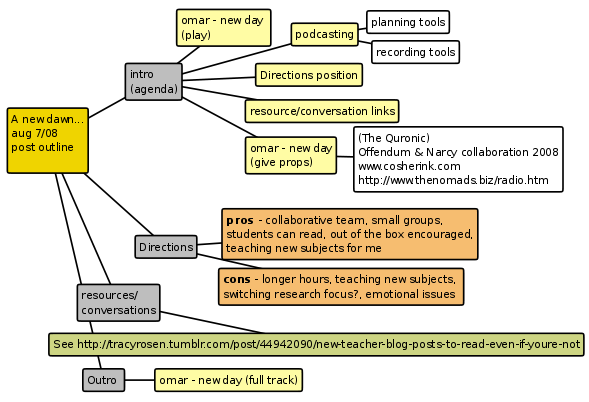 Voicethread on classroom management – add your voice! Just click on the ‘comment’ button and go for it. Listen to Omar Offendum’s New Day (RIP Nina Simone) by going to the Cosherink.com page and scrolling through the player. Heck, while you’re at it listen to all the tracks. Today I’m testing out podcasting. Discovery 1 – it’s easy-peasy with the tools (labyrinth and gnome sound-recorder) that came bundled in my Ubuntu 8.04 OS :) and an audio plugin that I already had installed on my blog. Discovery 2 – planning is a good thing when it comes to podcasting. And, for those who like to see/read. I’ve included the plan in this post. I’d like to use ogg vorbis instead of mp3 so I’ll have to find another way to integrate the audio into each post. Though again, I do like the simplicity of the plugin I use already – only thing is, it only recognizes mp3. Great first podcast. You are a natural! Can hardly wait to hear the next one. Like the graphic too, but then I’m a strong visual learner. When you talk about the alternative program you’ll be teaching next year, it brings back lots of fond memories for me of kids that I taught in the different alternative programs over the years. It’s so rewarding. You really get to make a difference. Oh, could you put a link to your other blog, please. 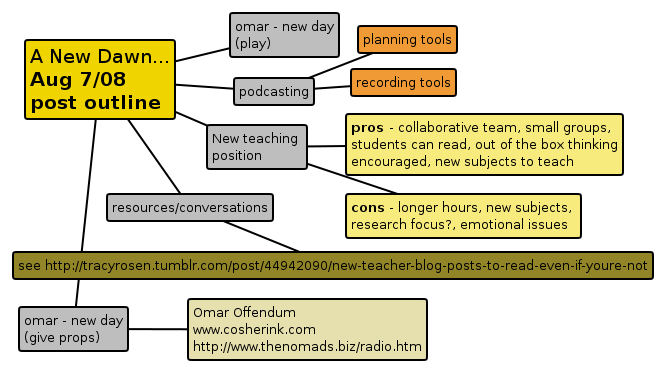 I am looking forward to this school year and, like I said in the podcast, I plan on keeping you and others on speed-twit – I’m so lucky to have met such great mentors/coaches/colleagues online.